Sea ice extent near Svalbard has rapidly dwindled since May 1. If you came here looking for good Arctic sea ice news, I have some. Kidding, there’s no such thing as good Arctic sea ice news these days. When we last checked in with ice in the north, the picture was, uh, not good! 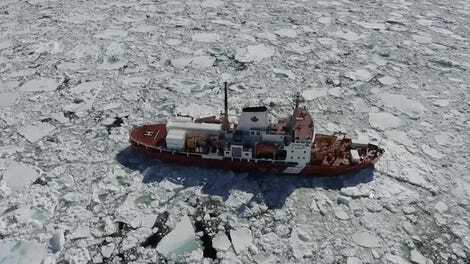 The Bering Sea had lost all of its ice roughly a month ahead of schedule. Now there’s a meltdown taking place on the other side of the Arctic. 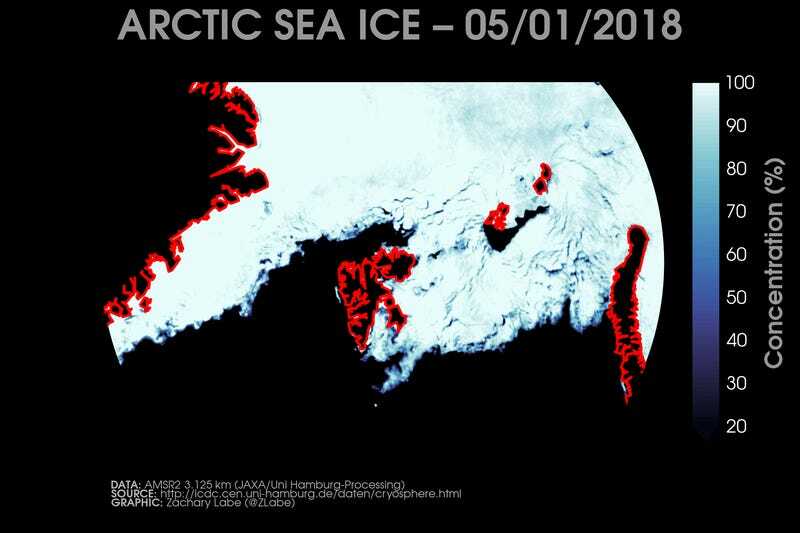 Arctic sea ice hit its second-lowest maximum on record this year after four years in a row of record lows. That left it in an already weakened state for the melt season, which usually sees icepack bottom out in September. But this melt season is already in exceptional territory around Svalbard with four more months to go. Labe said he suspected an early May intrusion of warm air could have preconditioned the ice to melt. In the weeks that followed, persistent warmth in the atmosphere—the island just had its warmest May on record—and the ocean coupled with storms could’ve further put the pinch on ice. This is both a freak meltdown and one that’s becoming far more common in this and other parts of the Arctic. Rising temperatures due to climate change have set off a feedback loop of more ice melt that in turn means more open water. That water absorbs more heat than the ice, which in turn drives more melting. The seas that ring the Arctic have all seen varying degrees of sea ice loss as a result of this human-driven catastrophe, but the Barents Sea has really suffered. “It’s also an area where we actually have good observations, which have been consistently signaling dramatic changes in climate,” Labe said. Rising air temperatures have helped kill the Barents Sea’s ice cover, but its waters are also changing dramatically. The sea sits on the margins of the Arctic and gets influenced by both the frigid waters to its north in the Arctic Ocean and the more temperate (relatively speaking) waters of the North Atlantic. The balance between these competing oceans appears to be shifting due to climate change. “The primary reason for the large loss of sea ice in the Barents Sea, including north and west of Svalbard, in the last few decades is the overall warming trend of the Atlantic water flowing into the region,” Arild Sundfjord, a senior scientist at the Norwegian Polar Institute, told Earther. The Atlantic, as you may have heard, doesn’t really do sea ice. And it seems in the coming decades, the Arctic might not either during the summer.